The picture of a Tree of Life has to be an archetype in the human mind because from ancient times it appears in myths, legends and paintings from all around the world. It's very easy to visualise. Its origin as a geometrical symbol in Kabbalah is veiled in mystery. Around the 16th century Kabbalists in Israel and Spain use the Tree of Life as a meditation symbol, a mandala, to represent the philosophical ideas presented in the classics of the Sepher Yetzirah, the Sepher Ha-Bahir and the Zohar. The Tree designed by the Ari (Isaac Luria, 1534-1572) only has one path connected to Malkhut, and two paths connecting Gevurah to Chokhmah and Chesed to Binah. The twenty-two Hebrew letters are arranged on the paths very neatly so that the three mother letters are on the three horizontal paths, the seven double letters occupy the seven vertical paths and the twelve simple letters occupy the twelve diagonal paths. Moreover the ten sephirot are given titles and positioned in hierarchical order on the Tree. However, the most well known version of the Tree of Life today is one that possibly comes from a magical tradition, which was first brought to light in 1652 by the scholar Athanasius Kircher (1602-1680) in his “Oedipus Aegyptiacus”. This Tree of Life might be an adaptation of one of the versions created by the Kabbalist Moses ben Cordovero (1522-1570), who Isaac Luria considered to be his teacher, or as some say Kircher's version of the Tree was taken from of a hidden oral Western tradition that originated in classical Greece and which was adopted later by the Jewish Kabbalists. This is the most popular version used today and the numbering of the twenty-two paths and correspondences to the Hebrew letters are identical with those of the Golden Dawn. In the Sepher Yetzirah, where we first learn of the ten Sephirot and the twenty-two paths, there are no diagrams at all. The origins of the Sepher Yetzirah are unknown, it is believed by some to have been written as early as 100 BCE but the text is quoted as late as the 6th century CE. There are five important versions of the classic, the shortest being 1300 words and the longest 2500 words. All of the above different arrangements of the ten sephirot and the twenty-two paths on the Tree of Life have merit in their own right as methods to examine scriptures, to train the mind to contemplate, to enable us to question and examine who we are, and where we are in an objective manner. Abstract diagrams serve as creative blueprints of the world we live in. Later Kabbalists in their writings gave titles to the sephirot and tried to associate these five polarities with moral qualities in line with the teachings of the Sepher Ha Bahir – which was written in parts, in Babylonia and Provence between the 10th and 12th century, and also the Zohar, a multi volumed commentary on the Old Testament, which appeared in Spain in the late 12th century, and which is said to have been the work of the Kabbalist Moses de Leon. The sephirot and the twenty-two paths are miraculous in the sense that they are simultaneously not of this world and yet part of it . 1) Keter, The Crown, 2) Chokhmah,Wisdom, 3) Binah, Understanding, 4) Chesed (or Gedulah), Mercy, Love, Righteousness 5) Gevurah (or Geburah or Din or Pachad ), fear, Judgement, Power, Might, Severity 6) Tipheret, Beauty, Peace, Truth 7) Netzach, Victory, Beauty Triumphant, Eternity, 8) Hod, Splendour, Glory, Reverberation- 9) Yesod, Foundation 10) Malkhut, the Kingdom, The Presence. In the 13th century an additional unnumbered Sephirah, Da'at – Knowledge – was added. “This addition arose from the desire to see each group of three Sephiroth as a unit comprising opposing attributes and as a synthesis to finally resolve them”. Here are two different logical methods for associating the twenty-two paths and letters to the ten Sephirot. The first from the creators of Galgal, and the second from the Golden Dawn. Galgal, the Master Game with commentaries by Eddie Prevost and Cherry Gilchrist (Scot o’ the Covert,1972). This was revised and re-published in 2002 as The Tree of Life Oracle by Cherry Gilchrist and Gila Zur (Eddison Sadd Editions). “Galgal” means Wheel or whirlwind. The Galgal method proposes that the sephirot and the twenty-two paths are forever being created in cycles as the“the lightning flash” rushes back and forth from Keter to Malkhut. For the Tree to be complete at every stage, as each new sephirah is touched by the lightning flash, all paths to it from the previous sephirot are also completed in hierarchical order. Every time a new path is created it is assigned a new letter in the traditional order of letters in the Hebrew alphabet, and this journey continues until all 22 letters have made their appearance. Here is my description of the Galgal method of numbering the twenty-two letters and paths, and I also include its meanings to the letters in brackets. I believe these meanings were derived by a process of meditation and free-association on the spelling of the Hebrew letters themselves. Beginning at Keter the lightning flash carries the Logos to Chokhmah and the 1st path is completed, Aleph (Multiply). It continues from Chesed to Gevurah forming the 5th path and the 5th letter, Heh (Being). As soon as Gevurah is touched the 6th path between Binah and Gevurah is formed, and the 6th letter, Vav (Secure). From Gevurah to Tiphereth the 7th path and 7th letter, Zayin (Listen) is formed. 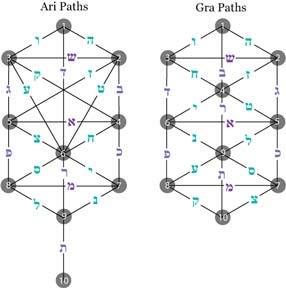 As soon as Tipheret is touched the paths to the previous sephirot are also formed in hierarchical order: The 8th path from Keter to Tipheret is filled by the 8th letter, Chet (Fear), the 9th path from Chokhmah to Tipheret carries the 9th letter, Tet (Draft), and the 10th path from Binah to Tipheret contains the 10th letter, Yod (Direct). The 11th path is completed between Chesed and Tipheret, and the 11th letter, Kaf (Incline) is born. The lightning flash continues from Tipheret to Netzach forming the 12th path and 12th letter, Lamed (Learn). As Netzach is touched the 13th path between Chesed and Netzach is completed, the 13th letter, Mem (Flow). The lightning flash continues from Hod to Yesod forming the 17th path and the 17th letter, Peh (Name). As Yesod is awoken the 18th path from Tipheret to Yesod is completed, the 18th letter Tsaddi (Integrity). Also the 19th path from Netzach to Yesod is completed as is the 19th letter, Qoph (Reproduce). Finally, from Yesod the lighting flash touches down on Malkhut the last sephirah, and the 20th path and 20th letter, Resh (Initiate) is born. The Path from Netzach to Malkhut completes the 21st path and 21st letter, Shin (Repeat), and the last 22nd path and 22nd letter, Tav (Impress) are completed from Hod to Malkhut. The creators of Galgal also associated the twenty-two Tarot trumps with the twenty-two letters and paths. These correspondences appear in Zev ben Shimon Halevi's “Tree of Life”. The traditional numbering of the Marseilles Tarot is followed until the 16th path when on the 17th path between Hod and Yesod the 0 card of the Fool is associated with the Hebrew letter Peh. This makes sense if one considers that someone who can't keep silent and is afflicted by incessant mindless chatter depletes his energy foolishly. In the following table I include astrological correspondences shown in the Sepher Yetzirah as well as alternative titles to the major trumps of the Tarot. Later, Éliphas Lévi (born Alphonse Louis Constant; 1810 –1875) was the first to develop a working system that associates the Tarot with the twenty-two Hebrew letters, using correspondences of the Sepher Yetzirah. He placed the 0 card of the Fool between the 20th and 21st cards . These correspondences were then adopted by the Englishman Frederick Holland (1854-1917) who went on to create his own Tarot deck. Instead of pictures he drew Hebrew letters surrounded by inscriptions in English. Frederick Holland then showed Éliphas Lévi's correspondences and pictures to Mathers – one of the founders of the Golden Dawn – These were then adopted but also altered by Mathers and this is how the Golden Dawn Tarot deck was born. It in turn influenced the ubiquitous Tarot decks of A.E. Waite and Aleister Crowley. The Kircher and Golden Dawn method of associating the twenty-two letters and paths is described by Donald Tyson's in his Millennium Magic in the chapter “Twenty-two Doors”. The logic is that one proceeds from the higher to the lower sephirah from the highest to the lowest angle whilst moving from right to left. The first 10 paths represent the sephirot and so the paths are numbered from the 11th to the 32nd . Despite the described flaw this is probably the most accepted and used system today. I have been describing the various meaningful associations of various occult traditions created over many centuries. It can all be very confusing to the ordinary mind. However, this is not a real problem at all if one retreats to the real Mind within. That I believe is the aim of contemplating symbols: to awaken within us a hidden separate reality that is all encompassing, a place from where all paradox is resolved. So it is possible after all to lift oneself up by ones own bootstraps.